And so I find myself at the end of the alphabet and my final post as part of the Ultimate Blog Challenge. X, Y and Z are stupidly tricky letters so I have lumped them together and I don’t care what the alphabet police have to say about it. I have never had a proper x-ray and I’ve never officially broken any bones (although I have a weirdly contorted toe from when I probably broke it and never did anything about it other than watch the nail fall off and limp about in flip flops for a few weeks). I don’t play the xylophone (I prefer the glokenspiel anyways). I can’t wear I can’t wear yellow, it makes my skin look a funny colour. One day me and Tom hope to live on a yacht, but that’s not happening yet. Let’s see what next year brings for us. Finally, Z is for ZOOLANDER. Because, because. WILBERFORCE! I have no knowledge of the contents of this book but it is one of my earliest memories of sitting in the back room at my nan’s house, looking at the cover. Wilberforce the Whale. It’s a book I will always associate with that time of my life; my early childhood; and yet I’ve never even read it. Maybe it should go on the reading list. Wouldn’t Wilberforce make a great name for a pet? Maybe even for a son? A month of mourning in Thailand. Thailand has entered a month of mourning following the death of His Holiness the Supreme Patriarch, Somdet Phra Nyanasamvara Suvaddhana Mahathera. The Supreme Patriarch is the head of the order of buddhist monks in Thailand – the most important monk, as chosen by the King (wikipedia.org). 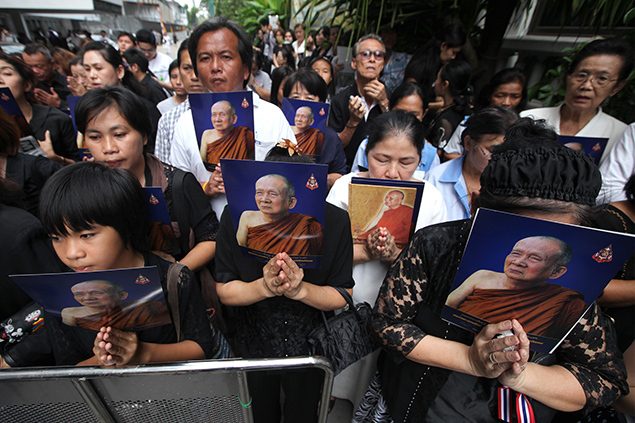 The usual period of mourning for a highly ordained monk is 15 days, but in this case it has been extended to the full 30 days usually reserved for the death of a royal – showing how truly important he was to the King and the nation of Thailand. So what does that mean for us foreigners? How will this period of mourning affect us? Firstly, today we were informed that we should try to wear black at school, or at least to avoid bright colours. I say informed, it was more of a by the way… as we left for lunch. It would be nice to be told these things properly, as I really don’t want to offend anyone! Stood there in my fuschia pink shirt and floral skirt I started mentally thrashing through the rail that holds all of my teaching clothes. Pink, orange, green, red, orange, pink, purple… I need to get myself some new mourning teacher clothes it seems. Local bars have shortened their opening hours (in Hat Yai that means closing at 1am as opposed to 4, 5 or 6am). Sales of alcohol will be limited and probably further affected as the funeral preparations take place (a standard funeral in Thailand is 4 days long so you can imagine that the head Monk’s funeral will take up most of the month ahead). A big party that a lot of foreigners were going to this weekend has been postponed until the end of next month – the organisers may not be Thai but they have common sense and cultural sensitivity. Big shows that had been planned for Loy Kratong celebrations (see this post for what I did last year) in the middle of the month may be toned down, fireworks cancelled and all generally excessive activities are to be avoided. It is difficult to find ourselves in the position of being in a foreign land at a very sensitive time. I don’t want to make any mistakes or come across as disrespectful so I am google searching as much as I can right now. Bangkok Post have some details but no one can seem to agree the official dates of mourning, so I guess I will just play it safe for the whole of November. Sorry if it’s a bit of a gloomy post but it is interesting to see how differently things are done here to how they are back home. We might get a token bank holiday so that everyone can watch the funeral being televised on BBC (who here remembers watching Princess Diana’s service?) but I reckon a month of mourning would interfere with the economy too much for the UK government to give it a second thought! V is for VOLUNTEERING. It may seem pretty boring, but it has been a part of me for a fair few years. I have volunteered in some way, shape or form for about ten years. The benefits of volunteering range far beyond the people you are directly helping; I even landed a couple of jobs out of volunteering so it can sometimes actually PAY to give a little first. I have volunteered in youth centres, making cups of tea in the evenings or being a kind ear to a worried teen. 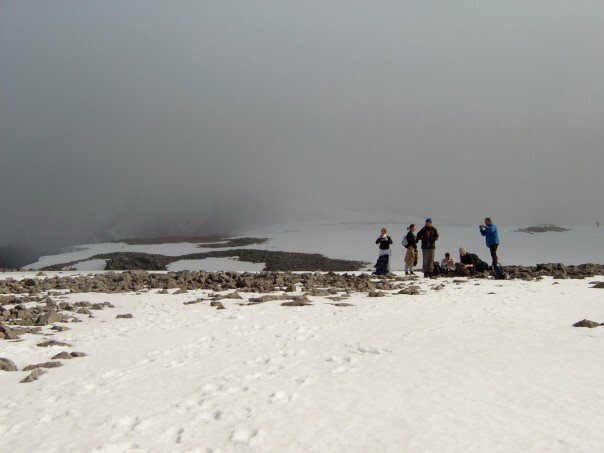 When I climbed Ben Nevis I was volunteering on a week youth camp in Scotland. I’ve helped out at church events (and I’m not a religious girl or anything) and been on litter picks along the Cornish coastline (although they were always repaid with free food!) but the main voluntary service I have been part of throughout all of that is the Girl Guides (10th Falmouth Methodist to be precise). I loved helping to run guides, especially as I was at the same unit that I went to as a young girl. I wasn’t the best guide, I got in trouble a few times and I left early when I got too cool. But I had been a rainbow, brownie and then guide so the uniformed services were a big part of my childhood and were something that I wanted to give back to. It was only a few hours a week but out of those few hours I got to help enable a group of lovely girls have something positive to do. Like I said, I’m not a religious girl and so some people are surprised to discover that I spent every Tuesday evening and some Sundays at the local Methodist Church, but our particular unit isn’t religious itself, other than the fact that we use a hall in a church and take part in spceial church parades every few months to fly the flag alongside the other uniformed services. We spent most of our time playing games, doing crafts, looking at issues affecting young girls today and generally being a lovely happy group of people. I got to go on a really fun regional camp (yes, camping, moi), and take part in plenty of outdoor activities and local community events. I also got to meet countless fellow leaders, all helping out for their own reasons but also sharing a common theme – we were doing it for the girls, because without voluntary leaders, there would be no uniformed services left, it’s that simple. The worry of losing young people on a trip is made slightly worse by being on the highest peak in the UK and walking into the clouds! When I came to Thailand, I had hoped to be part of guiding out here but it is nowhere near the same – it operates as part of school hours and isn’t voluntary – the girls don’t choose to participate, they have to. When I visited home a few weeks ago I went to see my old unit and it was really nice to see the girls and lots of new faces too. They had all brought books for me to bring back to Thailand so I now have a small library which I will be setting up at school for the students to dip into if they want to – how nice is that? Volunteering can only mean giving a few hours a week or even month, but the positive affect it can have on you, the people around you and your experiences makes it worth every minute. If you can, get out there and help in any way you can! U G L Y, you ain’t got no alibi, you UGLY, hey, hey, you UGLY! Bit of a reference there that only girls that grew up in the 90s are probably going to get. If you care to listen to a super annoying song that won’t get out of your head, watch the video below. Don’t do it. U is for UGLY. Don’t worry, this isn’t going to be some self-depricating post fishing for compliments, boo hoo, me no beautiful! NO. Most days as I walk around the high school in Thailand that I have the joy of teaching in Monday to Friday, it isn’t unusual to hear TEACHER SO BEAUTIFUL! being shouted down the corridoor. To begin with it was quite nice, until I realised that it is either a) one of the few things that the students can say in English or b) they consider me to be beautiful because I have white skin. The concept of beauty in Thailand is different to that of the UK. Which is in itself different to many other countries around the globe. In Thailand, the lighter your skin, the more beautiful you are. Young girls will often come up to me and lay their arm next to mine, comparing skin tone and cooing over how pale I am. It is unfortunately not unusual for the darkest student in a class to be pointed out, LOOK TEACHER, BLACK! To have dark skin means that you don’t have the luxury to be able to while away your days indoors while the lesser people toil away in the hot sun outside. It is a similar outlook that I remember discussing in my history class at school – an outlook that to me is dated and almost archaeic. Some Thai people will spend a lot of money pursuing this pale beauty. Many beauty products contain whitening agents (in some cases, harmful chemicals such as mercury) that will gradually lighten the skin. Talcom powder is plastered on to faces, necks and arms to cover up. Even when shopping for shower gel I have to read the small print (if I am lucky enough for it to be in English) or judge the packaging to avoid the whitening stuff. In many Western cultures, to having a tan is considered beautiful. Gradual tanning products, fake tan and bronzng powders are applied to darken the skin. People lay in sun beds and solariums, exposing themselves to harmful UV rays and and an increased chance of contracting cancer (suddenly the thought of skin bleaching products doesn’t seem so barbaric, does it?). As soon as the sun comes out, the t-shirts come off, the bikinis are on and the tanning begins. The situation couldn’t any more different in Thailand. Umbrellas are used not only for the torrential downpours but as a shield from the sun. Jumpers are zipped up, sleeves pulled down over hands, lest the sun’s rays touch bare skin. If we go away for the weekend and I spend some time topping up my tan, on my return to school I am told TEACHER, NO BEAUTIFUL! The whitest faces are used for advertising, are the face of all the main brands, the superstars, actors and actresses, plastered across bill boards, television adverts and the front of magazines. There have been some controvercial adverts recently. A Dunkin Donuts ad for their new ‘charcoal donut’ featured a woman in full black make up with the slogan ‘Break every rule of deliciousness’ – to me this suggests that perhaps the model breaks every rule of beauty also. Dunkin Donuts were slated for releasing the advert and had to remove it and issue an apology – read this article from The Guardian if you want to see what they had to say. Over on the television, an advert for L-Gluta skin0whitening drink (yes, they exist) caused a lot of controversy earlier in the year. In the ad, a brown bear is in a doctors office consulting with a light skinned female doctor. She is telling the bear that unfortunately he will have to wait a long time to become a white bear by avoiding the sun, and that it is a shame that it wasn’t born a human as it could simply drink the whitening drink being advertised. The part that caused the most controversy is the end of the ad, where the girls’ father, a black man, enters the room and asks her if everything is OK, the camera panning to a family portrait where the girl is black (but awfully ‘blacked up’. According to different reports (here and here), the father speaks Thai but in a farang accent, suggesting that the family had originally moved from another country, moving to Thailand and being helped along by the miraculour skin-whitening properties of this most wonderful product. Here is the video, it’s in Thai but you can see the general message in the advert. Around the world, beauty is dependant on individual and societal influences. It may be in the eye of the beholder, but where is the beholder getting their idea of beauty from?